Another day on this amazing journey began with a 7:00AM wake up for some breakfast, norm nominations, packing of buses and riddles to wake us up. 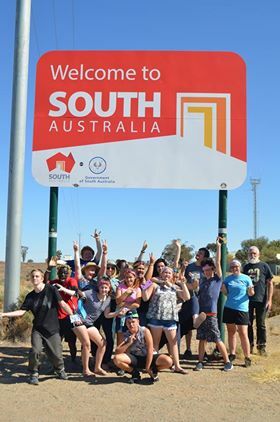 Port Augusta was an incredible experience and we are all ready and excited to move on to the next destination of our expedition, Coober Pedy! 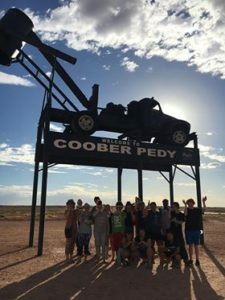 To get to Coober Pedy, it means we must cross the border, into South Australia! This is a big deal as it is the first time for many of our Young People to have left NSW. But before we get there, our day consists of a stop at Lake Hart, a huge salt lake and of course lots of fun and games on both buses. Today, we reflected on the “Water” story and learnt of how the first settlers treated and acted towards the Aboriginal people. It was inspiring to see how disappointed our Young People were about what happened and were starting to light a spark in their own lives to make a change. They are also so excited for the water ceremony that will be held while we are staying at Yulara, but more on that later. After, traveling for a few hours we finally reached the South Australian border!! After lunch, we passed the time with the movie, “Hunt for the Wilder People”. And just as the movie was finishing we pulled up at a spectacular Coober Pedy landmark for a quick photo. Because there are a lot of flies in Coober Pedy, we felt it was only right to take a snapshot of what we all look like while trying to rid of faces of the little buggers. After that, we made our way to our accommodation for the night, which was in an underground bunkhouse. We spent some free time playing card games, talking and exploring before jumping into our activity for the afternoon which was Secret Men’s and Women’s Business. This is a time were the girls and boys split into two groups to talk about some more serious topics and get real with one another. It was great to see the young people really take this time seriously and be open and vulnerable with their group. Once the night was finished, there was a real sense of nyuyuni and family. Bedtime was at 10:30PM, ready for a 5:30AM start the following morning. This early wake up is not a problem to the Young People because they know what awaits for them tomorrow… Uluru.! !